WarmMag Premium Responsive Blogger Template Free Download WarmMag Is a Clean Magazine Style Template for blogger Platform. Its High User Friendly Blogger Template. If You Blogger User This is a best Template For You, Mobile, Desktop And Tablet Friendly User Interface. Simple And Clean Color’s, Navigation Menu, Image Slider and Tabs Wight Ready Template. 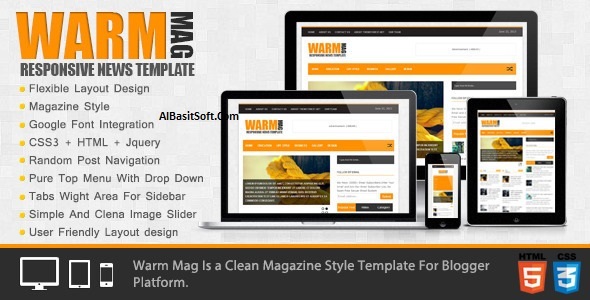 Warm Mag Theme Documentation Have Full Theme Edit and Modifying Helps. There Have Many Screen Shots and How To Edit This Videos Collection For You. A to z Blogger blog Creation to Theme Instillation Help Available. So New Blogger’s And Professional Blogger Can Understand How To Work With Warm Mag Blogger Template.